Welcome to Garden Bloggers’ Bloom Day for August 2011! Here in my USDA Hardiness Zone 5b garden in central Indiana, the blooms are set against a backdrop created by the driest July in recorded history and a stretch of days with high temperatures that were 90 F and above for over three weeks, besting a record set in the dust bowl year of 1936. I ventured out into the garden early Sunday morning to find some blooms and was greeted by the rain gauge flaunting an inch of rain from overnight storms. Leaves still had droplets of water on them and the garden looked almost relieved. I was relieved, too. Without this rain, a visitor might have assumed the garden had been neglected. Plants cried out for water and the ground clung to its weeds like a toddler clings to a security blanket. I did some watering through the driest days, but you can never water like the rain. Out in the vegetable garden, the sunflowers are beginning to bloom. The bright, lemony yellow happy face above is one of the many colors of sunflowers found in a mix called Flash Blend from Botanical Interests. Nearby the zinnias are also blooming even though by mid-afternoon on many days, they were as wilted as week old lettuce. These are are a hodge podge of varieties grown from seed sown directly in the garden in mid-June. I think the late sowing actually helped them through the dry spell. I've waited since spring to see the blooms in the newly planted August Dreams Gardens. It's still filling in and finding its way. 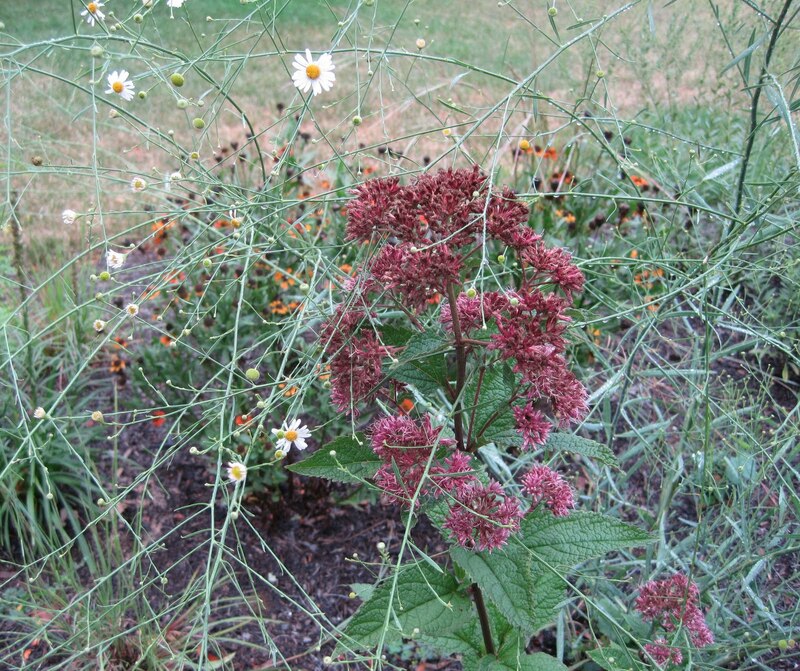 The large purplish-maroonish flowers are Eupatorium dubium 'Little Joe', the little white daisy flowers on those wispy light stems belong to Boltonia asteroides 'Snowbank' and the orange-ish flowers in the background are Helenium 'Helbro' sold as Mardi Gras. One end of this garden border is anchored by a popular perennial that helps support many late summer gardens... Rudbeckia hirta, Black-eyed Susans. August would not be the same without two other blooms that I can always count on. 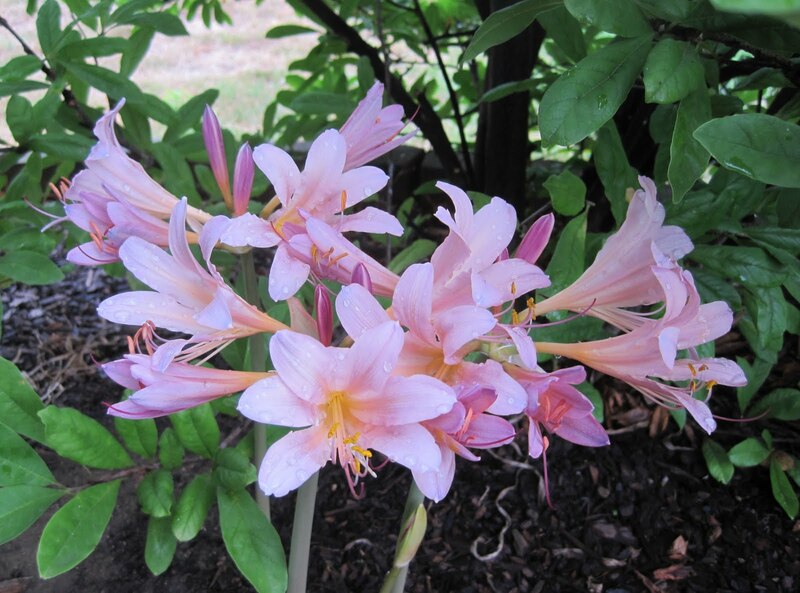 The Resurrection Lilies, Lycoris sp., showed up on schedule, popping up from the bare ground, their spring foliage long gone. 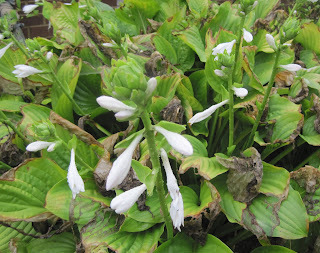 And the August lillies, a passalong Hosta, bloomed in spite of what July did to its foliage. It's been a long summer for them and they've looked better in past years. Finally, as I walked around the garden, noting where the dry, hot summer did its damage, I found a little Viola, a bloom that likes it cool, blooming away in the garden, unaware of how out of place it looked with all the blooms of August. The little viola probably has a lesson to teach us about overcoming adversity or something like that. I'll ponder that another day when it isn't so busy. What’s blooming in your garden as summer starts to wind its way toward its end? We would love to have you join in for Garden Bloggers’ Bloom Day and show us. It’s easy to participate and all are invited! Just post on your blog about what is blooming in your garden on the 15th of the month, leave a comment here to tell us what you have waiting for us to see and then put your name and the url to your post on the Mr. Linky widget below so we can pay you a virtual visit! I love the little surprise viola, Carol. We really can't control the garden, can we? What a wonderful time of year to write about what is blooming - cuz the answer in our garden is dahlias! That little Viola really does lift the spirits. I love the good surprises in the garden. The other sort seem to happen rather too often. Love the colour of the Eupatorium. That is just gorgeous. Trust the Zinnias to come through a hard dry summer. They look terrific. It's nice to hear you are getting some rain at least. I did not know you were fighting drought and heat as well. Your garden looks marvelous. I like the August Dreams idea. August is a tough month down here in Texas, but I've featuring purple flowers for the group. The rain had to be a relief for all, gardener and garden. The rain missed us and I have no clue how since it was a huge storm. But we are not nearly as bad as the rest of the country this August. You do have some pretty blooms this month. Happy GBBD to you. I love the viola! 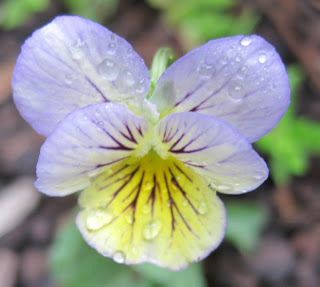 I've got violas coming up from seeds in a well-watered pot, but they're not blooming yet. We've had a very dry summer here too, and many of my perennials are shorter than normal. I imagine you singing in the rain like Gene Kelly! Love your zinnias and rudbeckia. Happy GBBD! You're so lucky to have had an inch of rain. We got a scant half inch yesterday; don't know the last time we had an inch. Love those raindrops on your plants.! My first time to join GBBD! It's so interesting to see that is blooming around the world. That is good news about your rain. I collect rain water but it rarely ever lasts beyond summer. Not just your viola with a lesson about adversity. I'd bet your hostas have a tale to tell as well. Glad that you did get an inch! That was quite the storm last night. It kept me awake for a couple of hours! Anything for rain in August. I love the lycoris... I have seen them but not thought of using them until seeing them here. Are they hardy in zone 5? I will have to check. Thanks for the opprotunity to share with so many great gardeners! I enjoy the sharing. 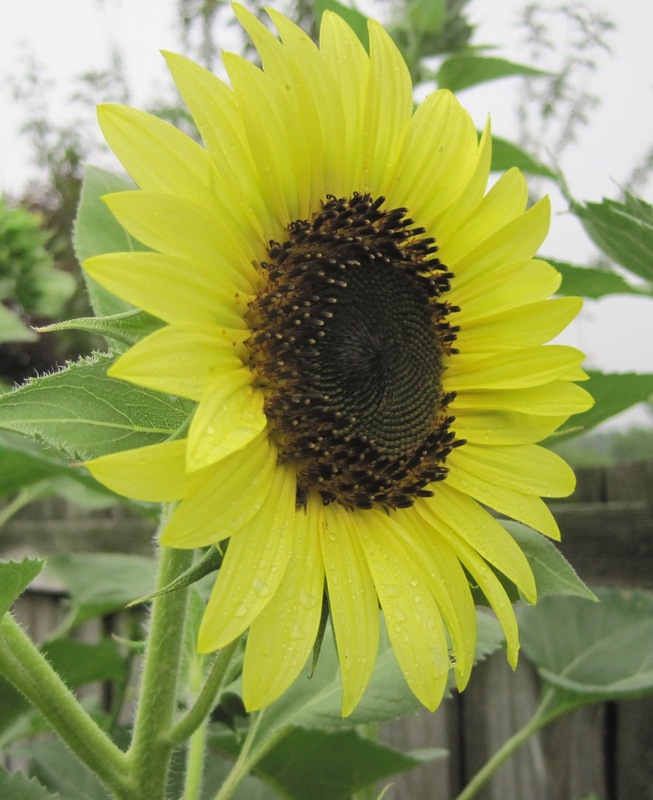 Your sunflower is such a happy photo to open your August Bloom Day post with Carol! The weather this summer sure has taken its toll on things. I've been amazed how many pansies and violas has survived so long this year. I was thinking 'they' must be breeding them more heat-tolerant or something. Happy Bloom Day, and thanks for hosting! love that sweet little viola. We were all laughing at my husband the other day who was telling us a story about his childhood - and how they used to have "sunflower seed plants". We were like, uh...sunflower seed plants are just called sunflowers. btw - I see no signs of neglect in your garden! Lovely to see the classic prairie perennials like Rudbeckia and Eupatorium. Hope you all in the Midwest and South get some cooler weather and rain soon! I love that photo of the sunflower. The petals are almost translucent! Your surprise lilies (resurecction lilies) are already up. That's amazing. I guess with a little more heat they come up earlier than they do in my Portland, OR, garden! It's great that we still have some blooms after the heat and lack of rain. Hopefully next month I'll still have a few flowers left to share. Thanks for hosting Bloom Day! I love your Zinnias, the colours are delicious! In Germany the weather was also strange this year: in spring we had no rain for about two monthts and the summer was the most rainiest I remember. Sunny and happy blooms you have today! Happy GBBD! Happy Garden Blogger's Bloom Day Carol! Your gardens are looking lovely. It's good to hear you got your rain. The well needed rains have finally been coming down for two days here in the northeast after a long drought and the gardens are loving it! I have often wondered this horrid summer how your new landscaping was taking the heat and drought. I know that watering isn't near as beneficial as a good rain. For one thing you will know what will be hardy when normal returns to the garden and you see what survived. Happy Garden Bloom Day. Very pretty blooms going on still for August. Hi, Carol! For once - in honour of meeting you - I have managed to get my act together and write a GBBD post! While travelling home from points north recently, I remarked at the dry landscape, too dry. However, once we reached our corner of Virginia the look changed to lush and full and moist. We have been blessed here with somewhat regular storm rains. I hope your rain gauge continues to see activity, because nothing deflates a gardener like a terrible drought. Thanks once again for throwing a great party. Carol, I am finding these monthly posts a really good way to record the garden's progress, thanks for hosting them. We're getting some rain, too, after a very hot, dry July. I like that eupatorium. When I saw it, I thought it was oregano at first. I still have quite a few blooms. Hi Carol, We too have had a hot, dry summer, at least the past two months. May and early June were very wet. You have some beauty in your garden and it was a pleasure to visit. Twelve more photos to give an idae of what is flowering in my Plymouth garden. Thanks again for hosting this. Also, love your Black-eyed Susans. Mind just started blooming too and I think they look great! Thanks for hosting, as usual. That sunflower was a wonderful way to start my Monday morning. Thank you. The resurrection lilies are really cool. One of my gardening friends has a plant that acts in a similar way, but the blooms are purple and crocus-like. We’re located in Zone 5 in MI. Any ideas? Carol, sorry to hear that your summer has been so tortuous! We've had a hot summer here in Denver, too, but a relatively wet one. It makes all the difference in the world! Thanks for hosting today's garden extravaganza! What a beautiful sunflower! We just got about three inches of rain Friday and Saturday and it was welcome indeed, but we're not suffering from the kind of drought you are too. Definitely makes gardening more of a challenge. The garden sure has been challenged. Here, by an extremely wet spring followed by extreme heat and no rain. Still, the garden blooms on. Love the combo of little joe, snowbank and mardi gras! So glad you finally had some rain. I am sure your garden will spring back to life. We had rain last night for the first time in our 6 week trip. It pounded on the roof of the trailer but this morning there is a clear blue sky again and everything is refreshed( All the plants I am carrying back from Seattle fling, including the one that bloomed especially for this day). Happy bloom day. How lucky we are to see your garden after a good rain! The viola is such a great symbol of strength and beauty in diffult times. Thank you for hosting! This summer sure has been one of the record books in so many places. Love your sunflower and zinnias. They look so cheerful and happy. I'm posting again about the roses that are blooming in my garden. It's been a hard year for any plant here! Thanks again for hosting. I look forward to seeing what's blooming in my garden every month, and in other gardens, too. I look forward to GBBD. I see it as a marker for progress in my garden compared to the previous month. I'm happy to report that I have more sunflowers this month than last! 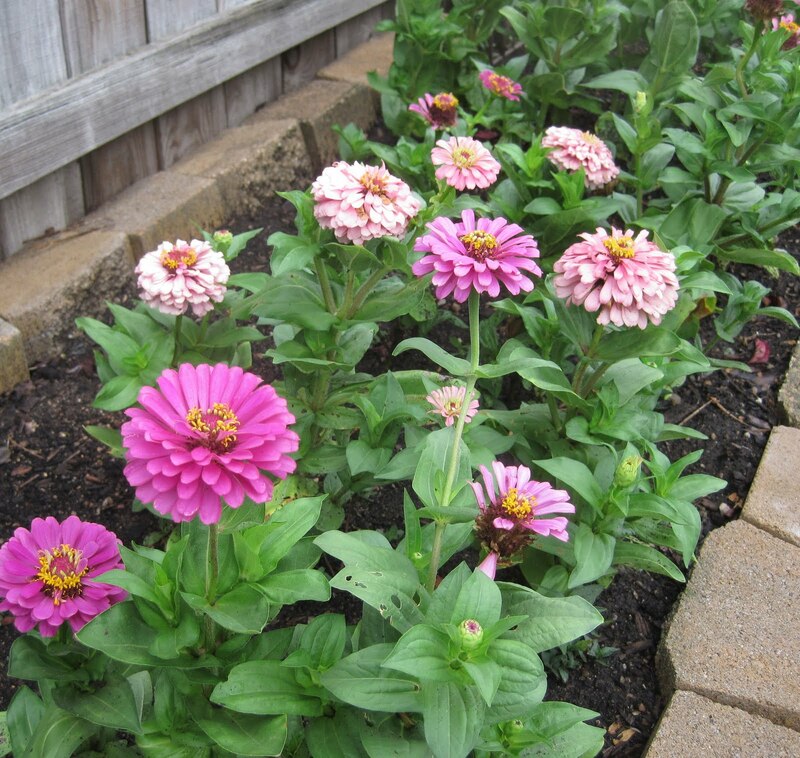 Beautiful blooms, Carol, especially the nice row of zinnias. Happy August! wearing their blooms and nothing else. What a way to beat the heat! I'm so glad your garden has been revived. July was just awful here until the last week, now we're swamped. My Lycoris is also blooming, but my August lilies are late this year. Don't look at yours, just enjoy the fantastic scent. Hello, this is my first GBBD, been meaning to get involved for ages! I think it's a wonderful idea, thanks for hosting! Hi Carol! I'm so happy to have met you last month in Seattle, it makes this month all the better to finally have met the person behind the blog. Love your zinnia's...some day I'll remember to plant some seeds. Is there any place in the country getting the right amount of rain this year? In Chicago, we had the same dry July, rain started with 8" on 7/23 and has hardly stopped since. We're now the second wettest year on record. 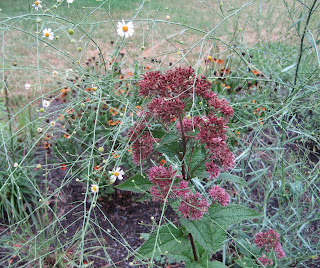 After the heat toasted everything, the rain mostly benefited the weeds. Your Zinnia seemed to fare better than ours. Just like your little Viola I have plenty of out of season flowers in the garden this month. However, I've chosen to show off a spiky version of one of my favourite flowers this month instead. My first time participating - hope to become a regular. 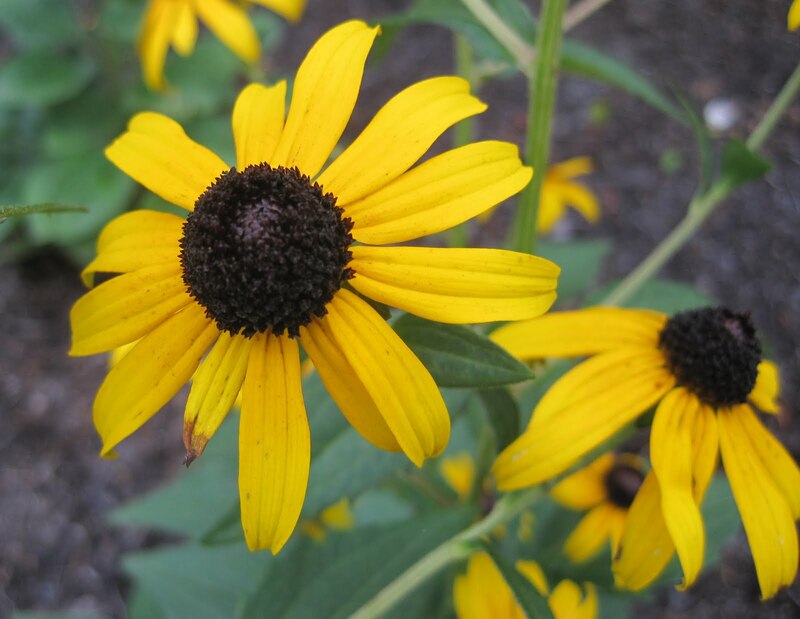 Rudbeckias have always been a favorite - very evocative of late summer! Oh, we have all had drought and flood this year. No, we cannot water like rain. Makes us appreciate when it finally does rain. Love, love, love the Resurrection Lilies! Putting them on my list. For some reason my Naked Ladies (aka Resurrection Lilies) were about a month earlier than all my neighbors, so mine are long gone now. But I love seeing them pop up everywhere esp at the homes of non-gardeners who likely have no idea they were there. I love the cheery sunflower and black-eyed susan. I don't have either of those in my garden, but they're so nice. Thanks for hosting bloom day. A great turnout as always. Cheers. I just want to say how much fun it is to participate in this every month, I sure enjoy it. I look forward to posting pictures of my garden and visiting all the other gardeners' blogs to see what's blooming now in their gardens too....I hope some of you will pay me a visit and I look forward paying all of you a visit who post here today and the next few days. It takes a while to see everyone but its always a really nice journey and well worth the time. You folks have a nice gardening day. I do love your zinnias Carol, mine all got munched before they ever flowered. But I think the viola takes the prize. Happy GBBD, and thank you for hosting. Beautiful photos! Can't wait to check out all of the links. I just found a link to your blog today and I'm your newest follower! I'm so glad I found your blog and I'm looking forward to reading your posts. It has been such a crazy summer, I decided to do a bit of a crazy post. Looking forward to reading what good things might be happening elsewhere. Thanks, as always, for hosting, Carol. Your flowers look nice, regardless of your hot / dry weather. Seems Texas' generosity with their heat and humidity is so great, they are sharing with Indiana, too. Not my fault this time! What a crazy little viola! So pretty. Your zinnias are very cheerful, too. Happy GBBD! I adore your sunflower! Always so cheerful. We've had a wierd summer too - now it's raining. Alot. My GBBD post is at www.wellylady.blogspot.com. Thanks for hosting Carol! Your blooms are lovely this month, as they are every month. Thanks for being our ever-gracious hostess. I'm at the end again. One 15th of the month I will be organized. Looking forward to having a read through other people's posts. Thanks for hosting, Carol. "you can never water like the rain". Well here in seattle we have had no significant rain for 3 months, so watering is the only way we stay "the emerald city!" A bright sunny sunflower. Mine are just opening. We are so far behind this year and with so little left of summer to catch up. Thanks for sharing that ray of sunshine! can't believe it's the middle of August! Enjoyed all the blooms of summer. Carol, Love the Lycoris. Maybe I'll put in some more! The viola does have the sweetest face. Looks as if you're not too bothered by snails - I think my poor munched viola might pack its bags and head on over to you! A drizzly day in upstate NY. Our garden is lush but, a bit surprisingly, it hasn't been the most successful year for us. But I am grateful we have rain! This really has been a crazy summer, it's amazing anything wants to bloom at all! I like the nickname resurrection lilies better than naked ladies. My August bloom day was brightened by new plants given to me by a friend. Passalong plants, can't beat 'em! Hi Carol joining in for the first time today, wonderful post and hope to look at a few others. Love your Sunflowers and Zinnas!! I wish I had planted a sunflower like yours, Carol - I love them so. In my garden, I'm very happy because one of my three giant pineapple lilies, Eucomis pole-evansii, is finally blooming this year. Those are pretty bloom even though in hot summer! Amazing! Other than the dratted morning glories, my fuschia, hostas, and roses are happily blooming and my bachelor's buttons are just starting. Unfortunately, so is my blog. Hopefully by next month it will be up and running enough for me to participate in this. My computer's dying on me, so it all depends on how quickly those problems get ironed out. Those resurrection lilies are beautiful! You've got to love the hardiness of bulbs. And I'm so glad you got some summer rain; I've got my fingers crossed that we'll get some in Texas soon. Here I am as usual, bringing up the rear! I finally posted my bloomers on the day to do it, instead of a few days late! So any points for that? Your beautiful sunflower looks like 'Valentine' one of my favorites! I'm rain dancing for rain for all my parched garden friends! But I'm not doing a resurrection lily dance, I promise! I'm so glad you got some rain relief today-what a nice surprise...for you AND your flowers! I love your sunflowers! What a sweet surprise that little viola must have been! Love the Rudbeckia as it's such great performer in August. Always look so fresh when other flowers are winding down. Your posting reminds me that I never got around to posting about the rain lilies this year that were such a welcome relief to the August doldrums. Thanks for hosting again. I'm glad you got some rain and a little relief from the heat. It was a scorcher this summer, wasn't it?! Thanks again for hosting! Woo-hoo! Finished my Bloom Day post while it was still Bloom Day in my time zone! Lots of vegetable plant blossoms this month, but my photos reveal that I've broken out and actually planted a few ornamentals this year. I hope those extras don't marginalize me as a kitchen gardener! Does it feel like Autumn to you? The bed of zinnias look cheerful enough, despite the dry spell. Thanks for another great GBBD. I'm so glad you've had some good rain too, Carol. It's a joy to see the gardens revive after a good soaking rain, isn't it? Happy Bloom Day and thanks for hosting. Didn'[t have time yesterday to look at any of the posts, so will enjoy doing it this morning when I need to fill a lot of time. Thanks for hosting - love the violet. Makes me feel cool and calm. It's amazing how your flowers look despite all the heat. Here in the PNW we have had cool weather which is hard on the tomatoes and other heat lovers. I'm grateful for the other vegetables that don't need so much heat. I'm late. I'm in Europe and I never know what day or time it is in the US. Nice sunflowers, Carol! It's taken me months to get myself organised enough to post some of my Bloom Day photo's on my blog. Happy to finally be joining in with what's growing here in the South of Scotland. What a great assortment. I am jealous of your blooming sunflowers: mine is a tiny bud. But I have roses! Lovely blooms in your garden! I know you enjoyed the rain . . . Stunning and beautifully captured Flowers. Love them all. I always love the sunflowers, and you have some beautiful ones. The large light yellow one is stunning..so summery. Hopefully July's heat and drought is gone for good! The cool and rain was welcomed in my central Iowa garden as it was in Indiana. Your sunfower is gorgeous - so happy and bright! It is great to see how many blooms you have in August! I love the pastel colors of your Resurrection Lilies, and the little Viola with raindrops. As always, I enjoy visiting the other gardens posted on this blog site. Thanks for hosting Bloom Day! The hostas may have flowers but the leaves bear silent witness to what a tough year you're having, Carol. Record breaking is only cool in sports - not in gardening! Thank heavens for sunflowers and zinnias. Nothing is lush here, but some things are alive. My GBBD post is on the main blog; the list with botanical names is at Annie's Addendum. Thank you very much, lovely to get to know your garden, pity about the climate we've had the exact different from you. Cold and rainy. I'm a bit late, but hope that will be OK. I'll endeavour to try again next month! Carol, thank you for your kind comments on my blog, I love Bloggers Bloom Day and am trying to learn how to participate! Your blooms here are beautiful. It has been so hot, but we can count on sunflowers and zinnias! Just discovered Blogger Bloom day via other uk blogs, great idea. You garden looks fabulous, we have an explosion of annuals colour at the moment in Scotland. I am very new to the garden blog world, and just today (the 19th) learned about Bloom Day. I've gone ahead and posted some Bloom Day pictures, even though they are four days late. I hope I will be forgiven! I am a gardener of about 30 years. I bought this place in 2006 so this is a new garden.